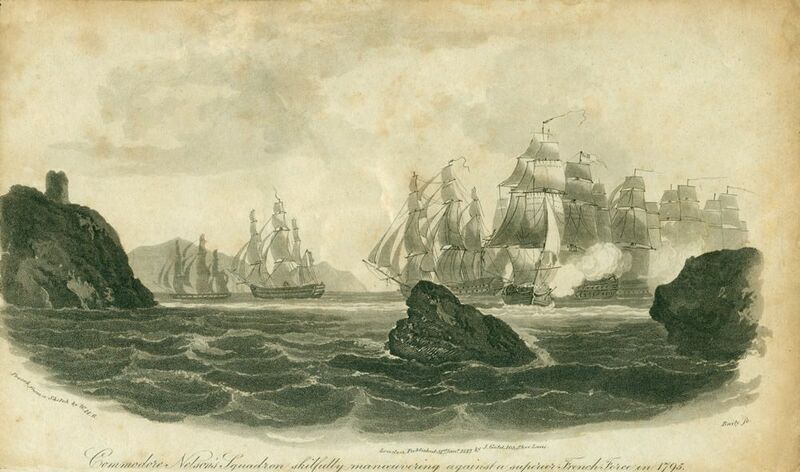 Black and white etching depicting Commodore Nelson's ships, including HMS Agamemnon, engaging in a battle with a French force in 1795, including the ship Ca Ira. There are two rocks in the foreground. The one to the left is pictured with a ruin of a fort on top. This Commodore Nelson's Squadron Skilfully Manoeuvering Against a Superior French Force in 1795 Art Print is created using state of the art, industry leading Digital printers. The result - a stunning reproduction at an affordable price.